I’m a big fan of hands-on research, getting into the action and gaining knowledge from the experience -- not that everything I set out to do is initially research. I was once at a friend’s cabin and we were out by the lake after dark. It was cloudy, so there was no moonlight or any way to see the person sitting across the table. I had previously ingested a glass of wine, which usually numbs my mouth, but I could sense that something wasn’t right with my face, like it was heavy or lopsided. It was really cold, numbing my hands as well, so I couldn’t feel my face when I touched it with my fingers. Feeling more and more disproportionate, I asked the people around me if they could see anything wrong. The response was, “It’s too dark -- we can’t see anything”. About ten minutes later, one of my friend’s sparked up his lighter for a cigarette and the looks of horror around the table as they gazed at me in the light of that tiny flame confirmed that my paranoia was legit. My lip had been stung by a wasp and my face had exploded in an allergic reaction. This is an incident that made it into Lelaina’s (the main character of Escapades) life as well. We were both gawked at by teenagers in emergency and had Angelina Jolie-style lips after twenty-four hours of antihistamines. And that is how I did my research – I wrote down all of my little ‘situations’ and picked the ones most likely to happen to a girl like Lelaina. Then I wrote down all the different rejections I’d received at screenplay pitch sessions in LA and started framing Lelaina’s life from there. Not all of Lelaina’s misadventures are mine, like I’ve never dressed as Catwoman, or any other superhero, to get the attention of an agent, but my research was more of an action based, trial-by-error exercise before writing. Knowing your subject from first-hand experience makes it so much easier to bring it to life on paper, so travel to the destination, go on a ride along, or spend the night in an emergency room. Sometimes the best way to find information is to get your hands dirty. And while it may not always turn out in your favor, it makes great material when you sit back down at your desk! 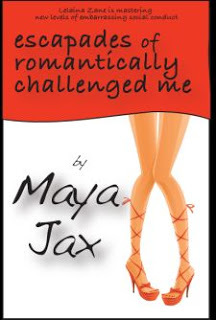 Loving spy and mystery novels, Maya Jax entertained the idea of being a secret agent and started working at an embassy overseas while doing her master’s in international relations. During this time, she finished her first screenplay, an action/thriller about spies and nuclear weapons. She pitched it to a friend in Hollywood, who told her she had talent, but to never - ever - show anyone the script again. Realizing her love for writing was stronger than her desire to spy and fight crime, she attempted a second screenplay focusing on what she knew best -- trying to make it as a writer. The screenplay turned into a manuscript and the result was chick lit novel Escapades of Romantically Challenged Me.